Just made this account to share information regarding trying to find this item. As mentioned in the follow up quest comments some connect this item to the "leek beer" 네 감각의 맥주 and the NPC 진준 in Jade Forest. I tried cooking the brew and drink it at the top of Neverest Pinnacle, inspecting the statue. Nothing. I drank the brew at Zin'Jun's questgiver location after completing the quests, nothing. I even walked over to the spot where he asked me to kill the monkey that killed his cat. Nothing. A friend to me drank the brew and duelled me at Zin'Juns supposed location. Nothing. I died and walked around Zin'Jun's supposed location aswell as the monkey in Spirit Form. Nothing. Killed 텔라리우스 보이드스트라이더 since he's blind like Illidan, but didn't drop from him. Just adding to the list of things we can exclude it dropping from. Edit: Also killed 알란디엔, 네사렐, and 테라스. Nothing from them. I became very interested in this item when I discovered that no one knows where it comes from. I figured I'd give it my best to figure it out..but, it's a puzzle. I remembered 눈먼 레오테라스, and went to take him out..unfortunately, no Blindfold. Will edit as I continue my search. Just found 참회자 오르무스, fits the criteria of human, but I tried many things, and had no luck with him either. I did a full Well of Eternity run, and tried nearly every emote on 일리단 스톰레이지 in every different phase. Still nothing. EDIT: I'm also starting to wonder if since this is a rank 9 brawl, if you've to be rank 9 to even recieve the quest item? Just a thought. EDIT 2: 참회자 오르무스 investigated. Did someone try Illidan yet? Or investigate the Statues around Zin'jun? someone has to try smth. here: 벌름이 i dont know if he's still there since hes supposed to be dead :( but its worth a try? You need Well-Worn Blindfold in order to challenge The Blind Hero. The location of this blindfold is still unknown. I have a hunch as to where to get this item, but it will contain spoilers for 5.3 so stop reading this if you don’t want any spoilers!. I have a feeling that you can get this item after you complete the 5.3 part of Wrathion his questline. For those that don’t know, the next part will be you fighting Wrathion and to make it more fair he will wear a blindfold. He’s available to both the Horde and the Alliance, it’s a blindfold, It has a little bit of blood on it, and it’s the only thing that I can think off. There is a theory floating around you get it for killing the rest of the bosses. Itd explain why its last on the list, as well as the hardest one (requires the highest rank). Has anyone managed to kill the rest of them? Because I am interested and have not finished my 5.2 legendary line, I'd love it if someone would listen to my idea and try it. Yes, I know Wrathion does not hand it to you, but he fits the description quite well as he takes the form of a human, is blindfolded in the 5.3 quest line, is interacted with regularly by both factions, and is great with a blade seeing as he is the rogue who led all other rogues to the legendaries in Cata. I would make most sense being him in my opinion so has anyone in 5.3 tried looking around his building (using the Four Senses Brew) or simply taunted him after they did the quest line? Reply with what happens for everyone please! So this reminds me of the PTR information regarding the 5.3 steps of the legendary questline. We are suppose to fight Wrathion while he is blindfolded. Each of the four celestials are for each role in the game; Tank, Range dps, Melee dps and healing. Each comes with its own script that leads to fighting Wrathion blindfolded. My guess is that after defeating him and obtaining the cloak, you will also loot a challenge card to battle him again. Considering the fact that one of those items is connected to cooking (Paper-Covered Rock from tilling), one to fishing (Impeccably Sharp Tooth from Pandaria fishing) and one from Archeology (Digmaster's Earthblade from Archeology sides and crates) is it possible that this item may be tied to the 4th secondary profession - First Aid? Since it's a blindfold it can be somehow connected to cloth crafting. Worth a shot to try I guess, since nobody has yet managed to find this item. Turns out I was wrong. The item seems to drop from Darkmoon Game Prize. Happy hunting! I see Shaith86 said he fought illidan in Well of Eternity. Has anyone attempted to fight him, possibly with the brew, in the Black Temple? Seems to me that the item wasn't implemented. As it stands this mystery remains unsloved for now. Should you require further assistance, please submit another help request the next time you are online. Well time to speculate more on this. The one possibility is that its from the DMF, which would explain why we don't have it yet. But things to focus in on--look at the quest to KILL the hero. The challenge card you've earned allows you to fight the Blind Hero, a mysterious warrior from a bygone age. Nobody surpasses his skill with a blade. Nobody. Luckily, he can't see anything. Have fun! Stop focusing on the blind part, I think might be the trick to this. "mysterious warrior from a bygone age"-- this makes me think of caverns of time, I have checked out escape from durnholde ashbringer event with no avail, but it might refer to ancient ruins, or a tomb. "Nobody surpasses his skill with a blade"--- We're talking about allegedly the best swordsman in warcraft, though perhaps not necessarily a sword. The demon hunters use blades, but we've explored those leads. Start thinking about anyone who was famous for their sword or their axe. Data mining--- See if we can data mine a model for the character in game, if possible. If we can figure out WHO it is, finding where it is might be easier. One more thing, blizzard loves making the brawlers guild joke bosses. "bygone era" could refer to content no longer in the game. So try to think of things that were taken out, particularly in cata, that involved a blind guy with a sword, or a really strong fighter with a sword. Further speculation--- it is "sunken in where the eyes should be" The wow demon hunters wear blindfolds until they can see without their eyes-- they don't remove their eyes. there clearly isnt a "blind hero" model in game. Either it isnt in the game at all or its under a different name, and assuming it is, its probably under the name of a character thats already known. This is simply an idea I'm throwing out for the source of this; recognize it's pure speculation. 1) Not implemented. However, I think by now if it wasn't implemented there's a pretty good chance Blizz would have said something by now, based on historically what has happened when they've neglected to implement part of a meta achievement. 2) From something people can't do at the moment. There's millions of people playing this game. Even if it was from something really rare and obscure, someone would have done it already and gotten it. Here's my thought. Darkmoon Faire hasn't been out yet. What's the type of thing that would sound like being associated with either a hero or blind and would make sense to get an item from it? 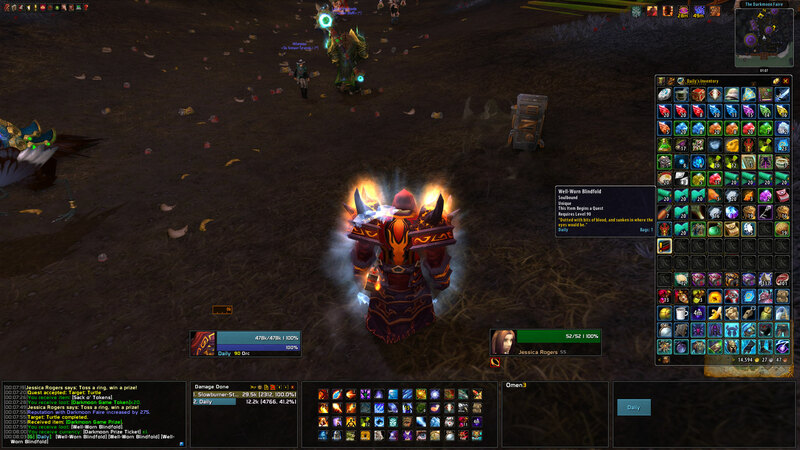 1) Loot the pvp chest at Darkmoon Faire that's up every 3 hours. Would make sense why it has to do with warriors. 2) A specific fortune from Sayge. This would be a pun on his "sight", since Sayge "sight" is the ability to see the future, and the Blind Hero's lack of sight (presumably) is a different type of sight. The thing about Sayge is, it could be that the invite is simply one of his possible fortunes, which means you would need a lot of people testing it. Other than the source, this has yet to be confirmed by a real player drop. The NPC and model do exist; it's on wowdb at http://www.wowdb.com/npcs/70794-blind-hero. I poked chaud until he added a datamined screenshot, too, though I'm not sure if it will help you all figure it out or not. Just spoke to a GM about this time, I know people' opinion of what GM say are vary to say the least but you can draw you own conclusion from my chat. http://imgur.com/RGZcAoD - This is a print screen of the chat in game i had. To me this seems that though it can drop from either the Heroic or the Greater scenario boxes it just being a lower then the rest drop chance. Did anyone tryed to kill someone who has the four sense brew up? Well obviously all GMs in Spain are stupid. I've sent more than 5 tickets asking for clear info on this item as half of the GMs would tell me it's ingame and the other half would tell me the exact opposite. After an entire day trying to speak with them (as they no longer contact you ingame when you open a ticket, or so it seems) a GM told me he had no idea and that I should give heroic caches a try since he'd read in wowhead that some german GM said smth like that. So far, no info about this item, but if the model datamined in wowdb is the right one, it must have something to do with Leotheras, just dunno what exactly. My guildie got this one today. He recieved it on a Random Scenario Chest. Meaning that this have nothing to do with killing Demon hunters or using the four senses brew. You just need to get lucky while doing your Scenarios! Hope it helps to all Brawler people. Well i was reading the comments over and over and came to the conclusion that It might be in Burning Crusade because the others have been in the other expansions. Also i think it might be a Demon Hunter of any kind seeing as they are the only ones i can think of that wear the blindfolds just like Altruis the Sufferer out in Nagrand. I made an account because I was looking at notable demon hunters and I found a fairly notable demon hunter, that matches the description, that was known back in Warcraft 3. So that matches the character of lore, he wore the bandana of course and also he used a blade..
Just got a reply from @Rygarius on Twitter regarding this item. I asked him "Is Well-Worn Blindfold currently obtainable in game? Seems to have the community stumped as to how to obtain it.". He replied: "We're looking into that. Potential hotfix in the works. :)"
Drek'Thar's blind, any ideas there? I tried some emotes (I'm horde) but it's probably a dead end if the "Blind Hero" is a DH model. Since Rygarius said it's currently obtainable, and no one has gotten it yet, I conclude it comes from Darkmoon Faire. "The earliest you may be able to find it is June 2nd." The item comes from 다크문 게임 경품 which can be acquired from each daily in the Darkmoon Faire - you have 35 chances at the item if you do all of the 5 dailies every day for the full duration of the faire. The bags are not soulbound so you can do the dailies on an alt (must be level 90), look inside the bag and if the blindfold is there mail it you the appropriate character. If you're really desperate to get this item ASAP, some people have suggested making level one characters to do the dailies with and mailing the bags to your main. NOTE: The level 1 characters will not be able to see the blindfold even if it's there, so you will have to check the bags on your main account. Since it is a hero from another time and he is in Darkmoon Island, you can suppose this one will be granted from a NPC that can be only seen as a ghost. There is a lot of ghost NPC in darkmoon island who can only be seen as ghost. 발사! 명중!, 놀 때려잡기, 목표: 다크문 거북이, 인간 대포알 and 통통 전차 사령관. Notice that you can trade or mail the blindfold by leaving it in the prize box. Confirmed to be in the Darkmoon Daily Prize Box. Just got mine after the third daily. Good luck! 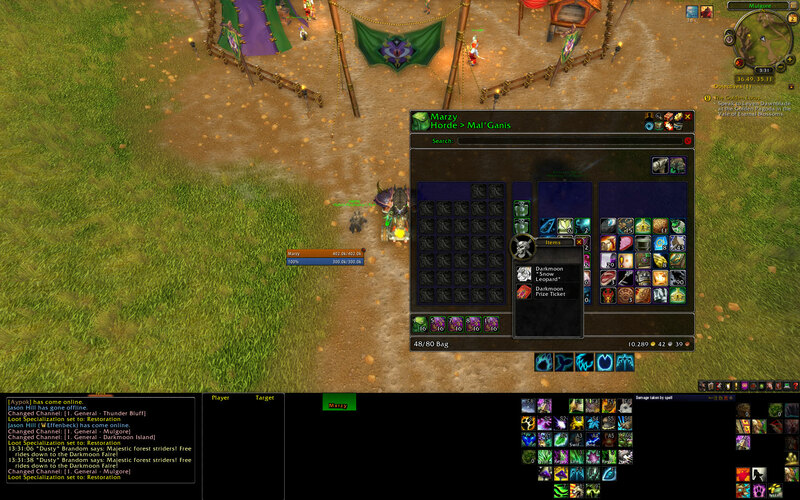 I just found the q item inside the Darkmoon Game Prize that you get from doing the daily quests on darkmoon faire. It was in my 4th chest/box. The boss himself I happened to one shot (playing as hunter) without any buffs, food or flask. He oneshot my pet twice with some cleave attack, but he was very easy, which is disappointing. I am still missing the Blingtron item, so here's hoping there will be some real challenge opened up once you defeat them all. I can confirm it's from Darkmoon faire. Just got it from the prize bag you get from doing the dailies. Just gone one from a Darkmoon Faire Daily reward. I got it from the Whack-a-mole but it's obviously random. I can confirm that this drops from the Darkmoon Game Prize you get from any daily in the Darkmoon Faire! The Blind Hero has 3 abilities; Swift Strike, Blind Strike and Blind Cleave. From what I could tell, if you get hit by a Blind Strike (cast in a random direction since he can't see you), he will cast Swift Strike, and each time another Swift Strike hits, the next one will be much faster cast. His Blind Cleave ability is a huge (over half the arena) 360-attack that hits quite hard and you should run away from it. Entered the arena in wrong spec (blood) but managed to kill it first try easily, doing around 95k dps. The boss had around 10 mill hp with a 2 min enrage timer. You can collect this item rather fast when you do the Darkmoon Fairy Dailies on your alts. Just do the dailies & check the content in the 다크문 게임 경품 with shift/ctrl click. When you found 낡아빠진 눈가리개 inside, just send the Prize to your Brawlers Guild character. If you are actually using lvl 1 alts to farm this, be sure to mail all of the 다크문 게임 경품 boxes to main character. Even if you could not see 낡아빠진 눈가리개 as a lvl 1 alt, your main may. It appears that lvl 90 is required to see the item inside. Probably boxes are going to be BoP soon though. Friend and I have been farming these, I thought I would note here for you guys: Not positive if you can get the blindfold outside of the faire, I got a blindfold on my alt, and hearthed to mail it, and....no blindfold once I hearthed. I went BACK into the faire, and the blindfold was there again. Not only the blindfold, but the entire contents of every box I had was alternating between two sets of items contained within: one outside of the faire, and one inside. CRZ bug? Who can say. But it's probably worth going in and out while you check boxes. http://i.imgur.com/j64Z47x.jpg http://i.imgur.com/Tid9Hmg.jpg These two images are the same box. Apparently a few CRZ realms are bugged and this item is not appearing on them. Many players, including myself have found out that if you are invited to Malganis(us) then this item will appear in a DMF Prize once you zone into that realms DMF. Had 15 Prizes with just tickets in them and after being invited to Malganis it appeared in the 3rd one. So, do we have any friends on Mal'ganis willing to post their battletag? Your neighborhood Mal'ganis white knight, always willing to help you get your blindfold. I have characters both Horde and Alliance. Ok so I am an avid achievement ! @#$% on Elune (US) who is rank 10 in Brawler's Guild and 2 away from getting the Deck Your Collection achievement (Blindfold and Blingtron) but am completely lost with this Blindfold. I had a friend make a level 1 alt on Mal'ganis and have opened 40+ bags on the server with no avail yet. Does it have to be a level 90? Is there some secret password? Any help would be appreciated, I refuse to believe I have this bad of luck when every comment says they got theirs within 10 once crossing over. I have no faith that this will be fixed and do not want to wait until next month, let me know if anyone can help! Thanks! Be careful: only level 90 players can see the 낡아빠진 눈가리개. So mail your 다크문 게임 경품 to the right character before opening. This it would seem is bugged on Dentarg-US. I have opened 80 boxes, and nothing. I have a few more boxes to open, but I am going to try to find someone to do the CRZ thing, as I am so sick of doing these games. If anyone could add me to CRZ group from the known realms it is working on, it would be much appreciated. Just got it after the server restart on Exodar. Seems the restart fixed the bug. Looked in bag before and was not there, and appeared after. Restart on realm today Dentarg US has fixed the issue where prizes were not dropping blindfold. Confirmed working for Oceanic realm and maybe all realms now after the fix earlier. Got mine in the same boxes that doesn't have the item before the fix. I got mine from the Tonk Commander daily quest in Darkmoon Faire. Last I had heard this wasn't found.. Get here now and it's posted everywhere. Just wanted to confirm it for everyone looking for it! Good luck! Just a small piece of information on this item. This can be looted more than once on the same character. Got my second today and only get the "You have already completed this quest" message. Maybe useless information to most but still information on the item none the less. You can get a second 낡아빠진 눈가리개, even if You completed the quest, and You can't use it, so it's just destroyable trash. This still drops in Legion prepatch. Confirmed. 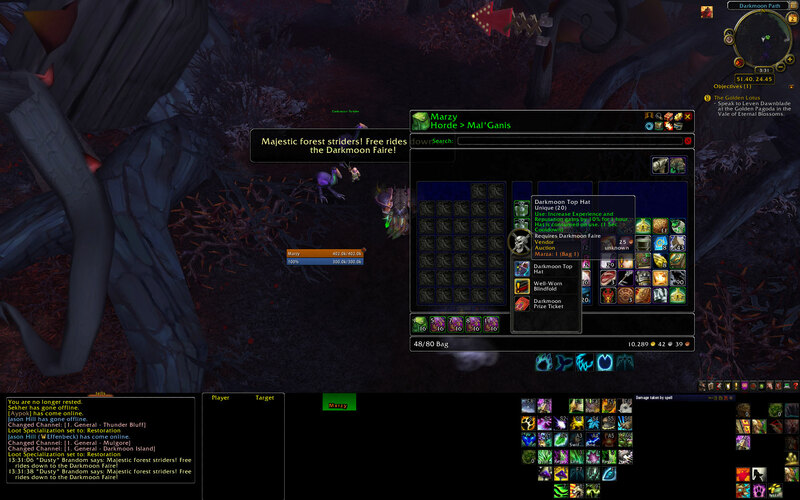 So apparently the brawler's guild was set to make a return in 7.1.5, but, as of now, 7.1, I have literally found it in my first darkmoon storage box. I also see it was suppousedly rare, but again, first box. I am posting this in 7.1 Legion and I got wanted the shirt and got the quest item on my first attempt at the group of dailies in one of the gifts at Darkmoon faire. Currently the Brawlers guild isnt back yet so when I turned in the item I got nothing. Is this item only a 1 time drop per character cause my main got it and Im not sure if ill ever get it on him again for when Brawlers comes back. Its my only geared character that would be able to do this and im not about to level and gear some alt just for a shirt. I received this item today from DMF however when I click on it it says I don't meet the requirements for the quest? I'm not seeing any other information here to fix this issue, has anyone else had the same problem or knows of a fix? "The quest item, "Dusty Old Robot" has been turned into a grey item with the return of the Brawler's Guild in Patch 7.1.5. Getting the error, "You don't meet the requirements for that quest" is because it's related to the old Brawler's Guild so the quest can't be turned in. The only thing that can be done with the item is destroying it and abandoning the quest if you previously had it"
This item still drops (7.2.0). 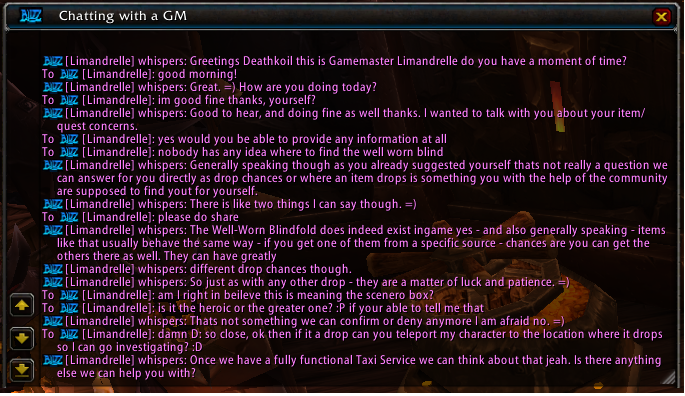 I have asked a GM and he confirms that the item is not supposed to drop at all as it cannot be turned in anymore (was part of Brawlers guild). It has been reported to the devs for removal via patch or hotfix. You can only delete the item as it cannot even be sold. Still drops as of 7.3. Still just as useless. Blizz, it's March 2018 and we're in 7.3.5 already. Time to take this out of the loot table! Still drops on 8.0 in BfA (today at the start of The Darkmoon Fair 7th October 2018). Come one Blizzard, remove it from loot tables or bring the Quest back! Still drops in 8.1.0 as of Feb 3rd 2019! Safe to delete as quest can no longer be done. Cannot even be sold to vendors. "피로 얼룩덜룩하고, 눈에 닿는 부분이 푹 꺼져 있습니다."